P-cadherin is frequently over-expressed in high-grade invasive breast carcinomas and has been reported to be an enhancer of migration and invasion of breast cancer cells, being correlated with tumour aggressiveness. In addition, expression of P-cadherin is well established as an indicator of poor prognosis in human breast cancer, which has stimulated our interest in studying its role in this setting. This review describes the most important findings on P-cadherin expression and function in normal mammary tissue and breast cancer cells, emphasizing that further research is required to elucidate the role played by this protein in human mammary tumours. Classical cadherins, such as E-cadherin, N-cadherin and P-cadherin, are the best characterized subgroup of adhesion proteins; they mediate calcium-dependent cell-cell bonds when they are localized to the adherens-type junctions. These cellular structures are found near to the apical surface of polarized epithelial cells, where E-cadherin (or epithelial cadherin) is the typical adhesion molecule present. However, other cadherins are found in similar structures in various cell types . P-cadherin (or placental cadherin) was the third classical cadherin to be identified and characterized in the mouse visceral endoderm cell line PSA5-E [2, 3], and it is this protein that constitutes the main subject of this review. Despite its name, P-cadherin is not expressed in human placenta ; its name results from the fact that this molecule was originally observed to be highly expressed in mouse placenta throughout pregnancy [2, 4]. The gene encoding P-cadherin (CDH3) is far less well characterized than is CDH1 (the gene that encodes E-cadherin), although they share 66% homology. It also maps to chromosome 16q22.1, a region that contains a cluster of several cadherin genes, just 32 kilobases upstream of the gene encoding human E-cadherin [5, 6]. Mutations in the CDH3 gene have been reported to be responsible for congenital hypotrichosis associated with juvenile macular dystrophy, which is a rare autosomal-recessive disorder characterized by abnormal growth of scalp hair, followed by progressive macular retinal degeneration that leads to early blindness . The mature P-cadherin glycoprotein has a molecular weight of 118 kDa, and its structure is similar to that of classical cadherins but different from those of E-cadherin and N-cadherin in terms of immunological specificity and molecular mass . It is comprised of three distinct domains (extracellular, transmembrane and cytoplasmic) and it mainly, but not exclusively, promotes homotypic interactions (between cadherins of the same type) [1, 2]. The amino-terminal domain is essential for the creation of lateral dimmers that act together in a zipper-like structure between neighbouring cells (Figure 1) . Schematic representation of the classical cadherin-catenin complex. Classical cadherins (blue), which mediate calcium-dependent (red) intercellular adhesion, are composed by an extracellular domain, a transmembrane domain and a cytoplasmic domain. This last domain comprises a juxtamembrane domain (JMD), which binds p120-catenin (violet), and a catenin-binding domain (CBD), which binds β-catenin (green), which in turns binds α-catenin (orange). Both α-catenin, α-actinin (grey) and vinculin (pink) establish a direct link between the cadherin-catenin complex and the actin cytoskeleton (yellow). The function and strength of P-cadherin mediated adhesion probably depends on its dynamic association with a group of cytoplasmic molecules, called catenins. These molecules serve to link the cadherin cytoplasmic tail to the actin cytoskeleton and facilitate clustering into the junctional structure, forming cadherin-catenin complexes (Figure 1) [8, 9]. This tail comprises two main domains: the catenin-binding domain (CBD), which is known to be essential for cadherin function, and the juxtamembrane domain (JMD), which has been suggested to play a critical role in allowing cells to relocate . The α, β, γ and p120 catenins are the documented interaction partners . β-Catenin (and also γ-catenin) is a signalling molecule that is involved in tissue patterning, and it is regulated by the CBD, tyrosine phosphorylation and transcriptional factors . P120-catenin interacts directly with the JMD and is also regulated by tyrosine kinases, modulating cadherin intracellular trafficking, stability, adhesive capacity and cell motility [12–14]. The α-catenin links the cadherin-catenin junctional complex to the actin cytoskeleton . In 1989, Shimoyama and coworkers  showed that NIH3T3 cells transfected with human P-cadherin cDNA expressed the functional cadherin molecule, which was able to mediate cell-cell adhesion. The amino-terminal domain is essential in determining the specificity of this molecule . Although both E-cadherin and P-cadherin are found in areas of cell-cell contact, the relative ease with which P-cadherin can be extracted from cells, using a non-ionic detergent, demonstrated weaker anchorage of this protein to the actin cytoskeleton when compared with E-cadherin. Also, the binding corresponds to less permanent cell-cell interactions than those attributed to epithelial cadherin . P-cadherin is transiently expressed in various tissues during development [17, 18] and its permanent expression is limited to adult epithelial tissues, at cell-cell boundaries . Unlike E-cadherin, which is broadly distributed in all epithelial tissues, P-cadherin exhibits a singular pattern of expression, co-localizing partially with E-cadherin and being restricted to the basal proliferative cell layer of the majority of stratified epithelia. Some authors have even suggested that its expression could be correlated with cell undifferentiation and proliferation in these type of tissues, as well as with the connection or segregation of cell layers, as found for other cadherins [2, 19–21]. The adherens-type junctions play an important role in cell sorting during embryogenesis and in the maintenance of specific organ and adult tissue architecture [22, 23]. They are also essential in intracellular signalling mechanisms [11, 24], which regulate cell polarity, differentiation, growth and migration . Because of their importance in normal development, disorders involving dysfunction of classical cadherins/catenins are related to various disease states, including cancer [10, 26, 27]. The formation of tissues and organs during embryogenesis requires the coordination of cellular processes, including cell polarization, aggregation, segregation and migration. Each of these processes depends on the expression of specific adhesion proteins. The various cadherin family members are expressed in specific spatiotemporal patterns during the development of an embryo, which is consistent with the view that cadherins play roles in regulation of morphogenesis and in tissue formation. It has become clear that cadherins constitute a major cellular adhesion/recognition system that confers upon cells the ability to sort from one another during embryogenesis, in order to form specific tissues. For example, cells transfected with E-cadherin segregate from cells transfected with P-cadherin when these two populations are mixed together in an aggregation assay . In addition, Steinberg and Takeichi  showed that cells expressing different levels of the same cadherin also sort from one another. Based on these experiments, the general idea is that when a group of cells separate from an existing cell layer, the segregating cells express a qualitatively or quantitatively altered set of cadherin family members. This might mean that cells are able to turn off some cadherin genes or turn on others during their lives . P-cadherin was first described in developing mouse embryos, specifically in the extra-embryonic ectoderm and in the visceral endoderm at the egg cylinder stage, but not in the embryonic ectoderm. Later, it is expressed in various tissues, with the mouse placenta and uterine decidua exhibiting the most abundant expression of this protein . Based on these findings, Nose and Takeichi  proposed that differential expression of P-cadherin on both sides of embryonic and maternal tissues of the early placenta could play a role in implantation and morphogenesis of mice embryos, by providing cells with heterogeneous adhesive specificities. The expression of P-cadherin is transient in several mouse tissues during development, and its permanent expression becomes limited to the epidermis, the mesothelium and the corneal endothelium . In the adult mouse, some tissues such as skin, intestine, heart and lung only weakly express this protein. Brain and liver are essentially negative for P-cadherin. In both mouse and human embryos, during the histogenesis of the surface epidermis and hair follicles, P-cadherin is expressed exclusively in the proliferating region of these tissues , segregating hair follicle keratinocytes into functionally distinct subpopulations . Based on these findings, P-cadherin has been described as being crucial for orderly progression of terminal differentiation of the epidermis . Mammary ducts and the highly mitotic terminal end buds from which they are derived consist of two layers of ectodermally derived epithelium, forming a 'tube within a tube' structure. Immunostaining shows abundant E-cadherin on the lateral membranes of end bud body cells and ductal luminal cells, but no P-cadherin expression. The basally located 'cap' cells, which represent the growth point for ductal development of the mammary gland and their differentiated descendants, the ductal myoepithelial cells, exhibit strong P-cadherin expression . Because functional blocking cadherin antibodies induce disruption of these layers, previous data indicate that spatially selective expression of E-cadherin and P-cadherin is required for mammary tissue integrity . Interestingly, virgin P-cadherin null female mice exhibit precocious differentiation of the mammary gland, and develop hyperplasia and dysplasia with age. These results indicate that P-cadherin mediated adhesion or signals derived from its cell-cell interactions are indeed important determinants of mammary gland growth control and in the maintenance of an undifferentiated state during a specific period of time . In normal adult nonlactating breast tissue, spatially selective expression of E-cadherin and P-cadherin appears to be important for mammary gland differentiation . E-cadherin is expressed by both luminal and myoepithelial cells, whereas P-cadherin is restricted to myoepithelial cells [35, 36]. However, during late pregnancy and lactation in humans and dogs P-cadherin is not found at cell-cell borders, as expected for an adhesion molecule, but rather appears to be secreted by epithelial cells [37, 38]. Additionally, an 80 kDa soluble fragment of P-cadherin is frequently found in body fluids, including milk from the lactating breast, although its biological role in this context is still unknown [37, 39, 40]. Because of the importance of cadherins in cell recognition, adhesion, sorting and signalling, their disruptive function of P-cadherin has significant implications in disease states, including cancer. P-cadherin has been detected as altered in various human tumours, but its role in the carcinogenic process remains unclear because it behaves differently depending on the cancer cell model studied. For example, P-cadherin behaves like a tumour suppressor gene in malignant melanoma, in which there is a progressive loss of normal E-cadherin and P-cadherin expression from melanocytes, followed by an increase in N-cadherin expression [41, 42]. This allows cells to invade and migrate, releasing them from the control of keratinocytes and enabling interaction with fibroblasts and vascular endothelial cells . Therefore, in this model P-cadherin functions as a pro-adhesive and anti-invasive molecule, inhibiting invasion and metastasis . On the other hand, and particularly in breast cancer, P-cadherin is able to enhance cell invasion and tumour aggressiveness, and constitutes a factor that indicates a poorer prognosis for the patient . Thus, our current understanding of the role played by P-cadherin in carcinogenesis and progression of breast cancer continues to direct research toward its putative value in diagnosis, prognosis and treatment of this heterogeneous disease. In human breast carcinomas, which represent a heterogeneous group of tumours that are diverse in behaviour, outcome and response to therapy, P-cadherin has been found to be aberrantly expressed in a small subgroup of carcinomas. Based on microarray technology, which allows linkage between different expression profiles and clinical outcome, this molecule essentially is expressed in those breast lesions termed basal-like carcinomas , which are negative for oestrogen receptor (ER), progesterone receptor (PgR) and HER2 (triple negative phenotype). These carcinomas carry poor prognosis, and there is still no specific or effective therapy for them . However, the use of particular markers that are expressed only in basal cells (or myoepithelial cells) of the mammary gland have led to a recently developed strategy to improve the diagnosis, prognosis and treatment in these tumours. This has heightened interest in conducting detailed studies of P-cadherin in this type of cancer. Aberrant expression of P-cadherin is detected in about 30% of known mammary cancer cell lines, which motivated its study in large series of breast carcinomas. In an early study reported in 1993 , P-cadherin was identified in only one out of 25 (4%) of invasive breast carcinomas (Table 1). In a subsequent study  its expression was observed in about 20% (9/45) of infiltrating ductal carcinomas and was related to reduced expression of E-cadherin and high tumour histological grade (Table 1) . 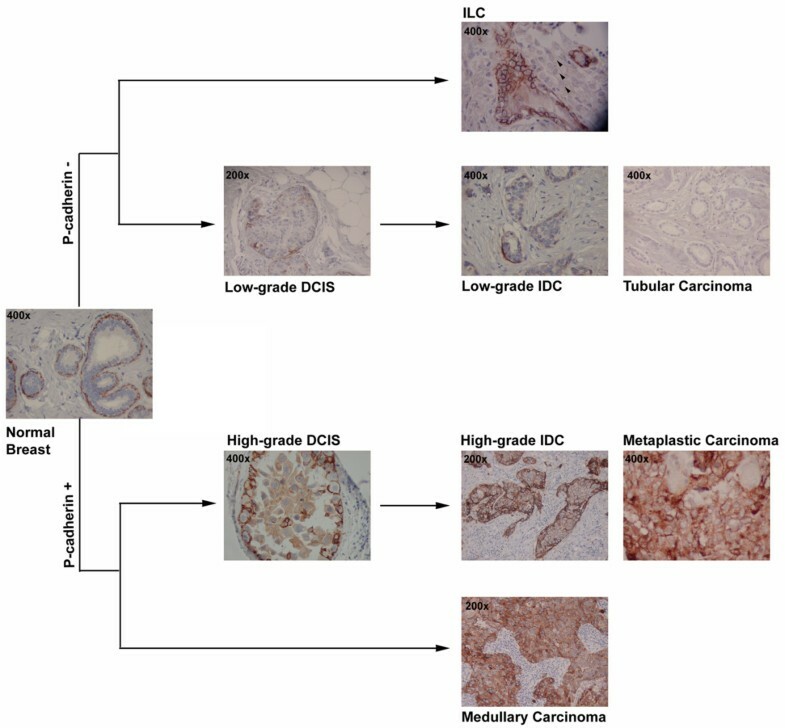 With the development of commercial P-cadherin monoclonal antibodies, it was demonstrated that P-cadherin is expressed in almost half of invasive ductal carcinomas of the breast (around 30% to 50%; Table 1) but it is infrequent in the lobular type, in which the main oncogenic event is loss of E-cadherin expression . Most importantly, P-cadherin expression was reported to be strongly associated with poor patient survival and was even considered to be a valuable independent prognostic factor in breast carcinogenesis in one of the studies performed (Table 1) [35, 44, 47–52]. Although a fragment of P-cadherin was detected in serum, which could be important for tumour diagnosis, its level was considerably lower and was not correlated with the presence of P-cadherin positive breast cancer . Summary of the results obtained in studies that assessed the prevalence of P-cadherin expression in invasive breast carcinomas and its correlation with various factors: tumour size, axillary lymph node metastasis, histological grade, levels of oestrogen receptor (ER), progesterone receptor (PgR), human epidermal growth factor receptor (HER)2, MIB1, epidermal growth factor receptor (EGFR), basal cytokeratins (CKs) and p53 expression, and patient survival. Information concerning whether P-cadherin was considered to be an independent predictor of outcome and about the monoclonal antibody (mAb) used in the immunohistochemistry (IHC) analysis is also included. +, direct significant correlation; -, inverse significant correlation; ND, not determined; NS, no significant correlation. In contrast with these findings, Madhavan and coworkers  found that 71% of cases were positive for P-cadherin in a series of invasive breast carcinomas, which they considered to be a good independent prognostic factor because it was associated with better patient survival (Table 1). These contradictory findings probably resulted from the choice of polyclonal antibody to detect P-cadherin, which cross-reacts with other cadherins. In 2002 our group demonstrated, for the first time, aberrant P-cadherin expression in a subset of ductal carcinomas in situ, demonstrating a predominant membranous staining (Figure 2) . Curiously, most of these cases were positive for E-cadherin, and regardless of the adopted histological classification P-cadherin expression was significantly associated with high histological grade and decreased cell polarity, as well as with nuclear pleomorphism. In contrast, all of the lobular carcinomas in situ that we studied were negative for P-cadherin. Schematic representation of P-cadherin positive and negative breast cancer histological types. In normal breast, P-cadherin is only expressed by myoepithelial cells and not by luminal epithelial cells. In the low-grade arm of breast carcinomas, the majority of lesions are negative for P-cadherin expression, such as invasive lobular carcinomas (ILC), tubular carcinomas, and well differentiated ductal carcinoma in situ (DCIS) and invasive ductal carcinomas (IDC). In the other arm, high-grade lesions are frequently positive for this cadherin, including the medullary carcinomas, a subset of poor-differentiated DCIS and IDC, and the metaplastic carcinomas, which represent a clear subtype of basal-like carcinomas. Using the same approach in a series of invasive breast carcinomas, we found 31% of tumour samples to exhibit moderate to intense P-cadherin membrane immunostaining, usually associated with cytoplasmic expression and sometimes focally distributed. Once again, P-cadherin expression was strongly correlated with high histological grade and with decreased patient survival over short-term follow up (Table 1). The probabilities of disease-free and overall survival were significantly lower for patients with P-cadherin positive tumours. Half of the studied cases were negative for E-cadherin, indicating a clear decrease in membranous staining in neoplastic epithelial cells. P-cadherin expression was independent of tumour size, lymph node metastasis and angiogenesis, as described in other studies (Table 1). Although no significant correlation was observed with histological type, the majority of positive P-cadherin tumours were invasive ductal carcinomas and metaplastic and medullary carcinomas (Figure 2) . We and others have also reported that P-cadherin expression is inversely related to hormonal receptor content (the majority of the cases are negative for ER and PgR) [35, 44, 47–52, 54, 55] and directly related to the expression of the epithelial growth factor receptor , HER2, p53 expression , high proliferation rates (MIB-1) and mitotic index and decreased cell differentiation, which are biological conditions with strong associations with poor survival of breast cancer patients [35, 44, 47, 48] (Table 1). Based on these findings, P-cadherin expression is considered a good indicator of poor prognosis in breast cancer patients. However, we and others have also found that this protein, together with p63 and cytokeratin (CK)5, can identify invasive basal-like carcinomas by immunohistochemistry [56, 57] and is one of the most useful adjunctive markers for distinguishing the precursor basal-like lesions of ductal carcinoma in situ . Interestingly, it was demonstrated that most hereditary BRCA1 mutated breast carcinomas are characterized by absence of ER and PgR, and expression of basal (myoepithelial) markers such as CK5/6 or P-cadherin [59, 60]. P-cadherin expression can be used to identify those patients who are likely to carry a BRCA1 germline mutation, thus indicating who should be screened first in families with a high incidence of breast and ovarian cancer [57, 59–62]. Very recently, Turner and coworkers  demonstrated that sporadic basal-like cancers exhibit a dysfunctional BRCA1 pathway, either by BRCA1 promoter methylation or by downregulation of its transcripts because of upregulation of the ID4-negative BRCA1 regulator . Based on this, it has been suggested that BRCA1 can transcriptionally regulate the basal phenotype, repressing genes such as those encoding CK5, CK17, or even P-cadherin. In breast cancer cells with a BRCA1 mutation, this repression does not occur and these genes are codified and expressed . The aberrant expression of P-cadherin by breast cancer cells has been explained by several hypotheses, although none has yet been proved valid. Palacios and coworkers  suggested that its expression could indicate a proliferative ability acquired by tumour cells with high mitotic index, to respond to E-cadherin downregulation and to maintain cancer cell nests. However, although this protein is essentially present in proliferative cells, no significant changes in proliferation rates were seen when breast cancer cells were transfected with P-cadherin cDNA (data not reported), indicating that it is not directly involved in cell division. Additionally, we also identified P-cadherin expression in E-cadherin positive cells, showing that expressions of these two cadherins are not mutually exclusive, as was previously proposed . An alternative to this theory is that P-cadherin could be a member of an oncofetal protein family, because it is highly expressed in embryogenesis and neoplasias, and is weakly and focally expressed in adult tissues . Nevertheless, there is not yet any evidence to confirm the validity of this hypothesis either. More recently it was suggested that the expression of P-cadherin by tumour cells could be related to a histogenetic origin in cap cells or acquisition of a phenotype with characteristics similar to this type of stem cell [47, 48]. The higher migration capacity of cap cells, the absence of ER expression, and the ability to differentiate into myoepithelial cells suggest that they could be responsible for the development of P-cadherin positive breast cancer cells [47, 65, 66]. The observation that metaplastic and medullary breast carcinomas are consistently immunoreactive for P-cadherin (Figure 2) [48, 67] supports a myoepithelial/basal-like transcriptomic programme for these lesions [67–72]. Han and coworkers  reported P-cadherin expression in all cases of sarcomatoid metaplastic breast carcinoma and carcinosarcomas, which is supported by our own findings. Sapino and colleagues , using rat mammary tumour-derived cell lines with clones that have epithelial and myoepithelial/basal phenotypes, demonstrated that myoepithelial clone derived tumours usually grow in a sarcomatous or carcinosarcomatous pattern, whereas epithelial derived tumours exhibited a carcinomatous pattern. One of our studies has yielded new evidence for a myoepithelial/basal-like transcriptomic programme for this heterogeneous group of neoplasms, because all cases were positive for at least one of the basal/myoepithelial markers studied, including P-cadherin . We also showed that P-cadherin expression in canine malignant tumours was significantly related to spindle cell carcinoma, carcinosarcoma and osteosarcoma. In these lesions, both carcinomatous and sarcomatous components of carcinosarcoma expressed P-cadherin [74, 75]. These findings support the hypothesis that there is a common histogenesis for both elements from stem cells, with the capacity for divergent differentiation, as suggested by several studies on human and canine mammary tumours , but more data are needed to clarify this issue. Although these specific types of P-cadherin positive carcinomas indeed appear to have a myoepithelial/basal-like transcriptomic programme, this explanation is unlikely to account for the percentage of P-cadherin expressing ductal carcinomas. In these specific lesions, it is easier to accept that some molecular mechanism would lead to activation of P-cadherin expression. However, expression of human P-cadherin has been demonstrated in mammary epithelial cells under control of the mouse mammary tumour virus promoter, and the effect on mammary gland behaviour was studied . P-cadherin was detected in most, but not all, luminal epithelial cells and was appropriately localized to cell-cell borders. Despite the robust and widespread expression of an inappropriate cadherin in epithelial cells, however, no effect was observed on mammary gland morphogenesis, architecture, lactation, or involution. Because previous published work had revealed that women whose tumours expressed P-cadherin had poorer prognosis than did women whose tumours lacked P-cadherin, Radice and coworkers  considered that P-cadherin expression might somehow increase the aggressive behaviour of mammary tumour cells. To test this possibility, they opted to induce mammary tumours in P-cadherin transgenic mice by mating them with a transgenic mouse model that develops mammary tumours in response to an oncogene, namely the mouse mammary tumour virus/neu mouse. However, the results were inconclusive because all of the detected tumours failed to express P-cadherin, despite the fact that the normal epithelium was positive . It therefore remains possible that if P-cadherin is mis-expressed following epithelial transformation, then it can alter the behaviour of the tumour cells and play a causal role in contributing to the poor survival of women with P-cadherin positive breast cancers. Based on this, it would be more appropriate to study the biological impact of induced P-cadherin expression in a model in which mice develop basal-like cancers, such as that recently described by McCarthy and coworkers . They presented a conditional mouse model of BRCA1 deficiency, which leads to basal-like tumour formation. Deciphering the mechanism that controls P-cadherin expression would be helpful in designing new therapies for P-cadherin positive breast tumours. It is known that expression of an inappropriate cadherin can result from stimulation by growth factors and hormones in the tumour environment, as well as from changes in the promoter regions of cadherin encoding genes . For example, changes in DNA methylation or acetylation in tumour cells might trigger improper cadherin expression, as is well established for the E-cadherin gene . The sequence of the upstream 5' region of the P-cadherin gene exhibits structural similarities to the 5' region of the E-cadherin gene : absence of a TATA box, presence of a CAAT box, two putative AP2-binding motifs, and a CG-rich region containing several Sp1-binding elements, which are characteristic of CpG islands. However, no homologous sequence to the palindromic sequence E-pal found on the E-cadherin promoter (for repressor elements) has been found in the 5' region of the P-cadherin gene . Some years ago, Jarrard and coworkers  found that cytosine methylation of this region occurs in P-cadherin negative prostate cancer cell lines but not in cell lines expressing this protein. However, in vivo, a lack of expression in 12 prostate cancer specimens was not associated with methylation of the P-cadherin promoter. Recently, we found a significant correlation between P-cadherin expression and hypomethylation of a specific region of the CDH3 promoter, suggesting an important regulatory role for cytosine methylation in the aberrant expression of P-cadherin in breast cancer . Interestingly, using laser microdissection, we were able to study normal P-cadherin negative epithelial/luminal cells, which we found to be consistently methylated in this promoter region. It is becoming increasingly clear that all of the information received from cell-cell, cell-matrix, and growth factor and hormone signalling determines ultimate cellular phenotype and behaviour during normal embryonic development and during abnormal processes, such as tumourigenesis. Therefore, signalling pathways that are involved in the regulation of cadherin-mediated adhesion are thought to underlie the dynamics of the adhesive interactions between cells [81, 82]. Thus far, little is known about the signalling pathways that may be involved in regulation of P-cadherin expression in breast cancer cells. One of our aims has been to characterize which intracellular pathways could induce P-cadherin expression in breast carcinomas. Based on the fact that P-cadherin positive tumours are essentially ER negative, we opted to study the link between ER signalling and the regulation of P-cadherin expression in breast cancer cell lines. Thus, it was postulated that P-cadherin expression in breast carcinomas could be related to a phenotype that is insensitive to circulating hormones, as has been suggested by Gamallo and coworkers  in invasive ductal breast carcinomas and by Soler and colleagues  in prostate cancer. Interestingly, we found that abnormal P-cadherin expression results from a lack of ER-α signalling , because treatment of breast cancer cells with the pure anti-oestrogen ICI 182,780 can induce a twofold to threefold increase in protein and mRNA levels. This effect was time and dose dependent, and could be counteracted by 17β-oestradiol (E2) . Taken together, these findings suggest that the lack of ER-α signalling is responsible for the increase in P-cadherin, categorizing CDH3 as an oestrogen-repressed gene and pointing to E2 as a key regulator of this cadherin. Finally, it remained to be determined whether induction of the P-cadherin gene is a direct effect of anti-oestrogens or requires prior induction of other genes. In one study  blocking protein synthesis in cells with cycloheximide, to which induction of primary target proteins should not be sensitive, potently inhibited P-cadherin upregulation by ICI 182,780. This finding was consistent with a requirement for newly synthesized proteins, probably induced by the anti-oestrogen, before CDH3 activation. We have demonstrated that treatment of MCF-7/AZ breast cancer cells with ICI 182,780 leads to decreased cell-cell adhesion and promotion of invasion in vitro . This is in accordance with the finding that E2 , and even the unliganded receptor , may decrease in vitro invasiveness and motility of breast cancer cells, suggesting that some oestrogen-regulated genes negatively control invasion. Because this control is lost in cells treated with high concentrations of ICI 182,780, which upregulate P-cadherin, the effect of the latter has been further investigated in in vitro aggregation and invasion of cells retrovirally transduced with P-cadherin . Cancer cells can invade into neighbouring tissues, surviving in these ectopic sites and giving rise to metastases in secondary organs, when the normal regulation of a complex network of signalling pathways that are involved in proliferation and migration is lost . Although aberrant epithelial P-cadherin expression is associated with a proliferative and undifferentiated cell phenotype related to ulceration and neoplastic transformation, the relative functional role played by P-cadherin in breast cancer cell invasion and motility is not fully elucidated . This is due in part to results obtained with transgenic mice expressing high levels of P-cadherin in the normal mammary epithelium that did not develop tumours, even when neu oncogene induced mammary tumours were produced, giving rise to consistently P-cadherin negative lesions . Loss of cell polarity is one of the indicators of cell undifferentiation, and adhesion molecules normally provide the spatial structure for the establishment of a polarized epithelium [88, 89]. The progression from normal polarized epithelia to a malignant invasive phenotype is attributed in part to loss of E-cadherin, with a resulting increase in cell motility. However, some studies have suggested that other mechanisms should be able to induce loss of cell polarity without loss of epithelial cadherin expression . Based on our previous findings, we suggested that aberrant P-cadherin expression can also be responsible for loss of cell polarity because it mediates weaker and unstable cell-cell contacts, which are easily broken and reformed [44, 49, 54] and are unable to maintain differentiated epithelial cells. We therefore opted to study the role played by P-cadherin in breast cancer cell aggregation and invasion. Surprisingly, we found that P-cadherin retroviral transduction of MCF-7/AZ breast cancer cells (E-cadherin positive) did not produce striking changes in cell-cell aggregation, which suggested that P-cadherin does not shift the balance of aggregation established by the endogenous cadherin in this system . By contrast, such a balance could well be changed for invasion, because we found that P-cadherin transduction was enough for induction of invasion. Because the pro-invasive action of P-cadherin is unlikely to be the result of alterations in cell-cell adhesion, we presumed that the pro-invasive activity of P-cadherin was due to changes in cytoplasmic signalling pathways, as was described for E-cadherin. Wong and Gumbiner  attributed the anti-invasive activity of wild-type E-cadherin to its interaction with β-catenin, because an E-cadherin mutant, retaining the CBD but with a point mutation that abolishes p120-catenin binding, was still able to suppress invasion. Indeed, in the case of P-cadherin, we have found that maintenance of the JMD is crucial for induction of invasion, irrespective of the CBD . We showed that P-cadherin is unable to induce invasion when its JMD is not present or when the p120-catenin binding domain is mutated, suggesting a role for this catenin in the induction by P-cadherin of cell invasion . The JMD binding to p120-catenin has been already implicated in the stable maintenance of endogenous cadherins [13, 92]. Ireton and colleagues  showed that restoration of p120-catenin in a colon carcinoma cell line resulted in E-cadherin stabilization and rescue of its function, either directly or indirectly by preventing other proteins from hampering E-cadherin. Based on this finding, we suggested that a related mechanism could account for the induction of invasion by P-cadherin, in which destabilization of anti-invasive cadherin/catenin complexes would result from competition for the available p120-catenin. Alternatively, P-cadherin could generate a specific pro-invasive signal via its JMD. In this hypothesis, JMD binding of p120-catenin, or other proteins, to P-cadherin must differ from the binding to E-cadherin or N-cadherin in terms of strength, conformation, or recruitment of other members of the complex. This, in turn, may result in the activation of pathways that overcome the suppressive signals mediated by the endogenous cadherins. Recently, in accordance with our findings, it was shown that the differences between E-cadherin and N-cadherin in recruitment of various phosphorylated isoforms of p120-catenin to the membrane might be responsible for the inability of N-cadherin to replace E-cadherin as a suppressor of invasion in pancreatic carcinoma cells . Although the JMD of cadherins is highly conserved, it is important to note that its function is dependent on cell type. It may both positively and negatively regulate cadherin activity [94–98]. Except for the demonstrated induction of invasion, no regulatory functions have been described for the P-cadherin JMD. Although binding of proteins to the JMD of P-cadherin has been documented only for p120-catenin , we cannot exclude the possibility that its disruption introduces conformational changes or uncouples the interaction of other proteins that could be responsible for the observed effects. Striking examples of this were shown for E-cadherin, in which functional differences were noted between larger and minimal deletions of the JMD, with even minimal changes disrupting binding of multiple molecules . Data on the role played by p120-catenin in normal and cancer cells are also conflicting. Positive and negative regulation of cell-cell adhesion and motility possibly reflect differences in cell type, cadherins, p120-catenin isoforms, and shuttling between cadherin-bound and cytoplasmic pools . When over-expressed in the cytoplasm, p120-catenin may regulate the actin cytoskeleton and cell motility, through Rho GTPase activity . Similarly, in our experiments differences in binding strength between E-cadherin, N-cadherin and P-cadherin bound p120-catenin may influence its effect on the activity of the Rho GTPases, possibly making the cells more likely to invade. Alternatively, the panel of molecules recruited by p120-catenin may differ depending on the cadherin it is bound to. Recently, Taniuchi and coworkers  reported that P-cadherin is also over-expressed in the majority of pancreatic ductal adenocarcinomas and that this over-expression is strongly associated with cytoplasmic accumulation of p120-catenin, activating Rho GTPases and promoting cell motility. Recently, we also found that P-cadherin can induce migration and motility of breast cancer cells, bringing the majority of p120-catenin to the cytoplasm and changing the actin phenotype of these cells (lamelipodia and filopodia formation). These cells can even produce a greater amount of matrix metalloproteases, which explains their capacity to invade through collagen and matrigel (data not published). In summary, our work establishes a novel role for JMD and distinguishes P-cadherin mediated invasion from invasion induced, for example, by N-cadherin, which depends on a physical interaction with fibroblast growth factor receptor [53, 104]. Moreover, although the P-cadherin JMD differs in only few amino acids from the corresponding E-cadherin domain, it exerts an opposing function; whereas E-cadherin JMD suppresses motility , P-cadherin JMD plays a role in cell invasion. To elucidate why such related domains can have opposite functions, it will be crucial to identify new interaction partners or to study whether the interaction of known partner molecules differs between these cadherins. Several reports have already indicated that P-cadherin expression in mammary carcinomas is associated with poor prognosis in patients [45, 48, 49]. However, the effect and regulation of this protein in breast tumour cell biology, and consequently in the progression of this disease, remain unknown. The experiments and results that are discussed in the present review provide four novel insights into the role played by P-cadherin in breast carcinogenesis. Specifically, they show that its expression is associated with more aggressive tumours and with shorter patient survival; it reflects the methylation status of its promoter gene; it is regulated by the ER-α signalling pathway; and it is involved in the ability of cells to invade through artificial extracellular matrices, such as collagen type I and matrigel. It remains to be determined whether P-cadherin is an independent predictor of outcome and a true determinant of the biology of breast cancers, or is a mere surrogate marker for a more global basal-like profile. The performance of this review was supported by four research grants (Joana Paredes: SFRH/BPD/15319/2005; André Albergaria: SFRH/BD/15316/2005; Ana Sofia Ribeiro: POCI/BIA-BCM/59252/2004; and Ana Luísa Correia: POCI/N/07.01.02/10/25/2005) and by a scientific project (POCI/BIA-BCM/59252/2004), all financed by the Portuguese Science and Technology Foundation. We also give thanks to the Calouste Gulbenkian Foundation for the 'Programa Gulbenkian de Estímulo à Investigação (FCG 55/05)'. We thank Dr Ursula McGovern for help in the English text edition.